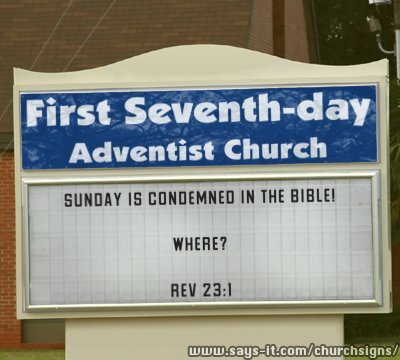 6 Responses to Where is Sunday condemned in the Bible? I don’t yet have such a book. I am just a little confused; there are only 22 chapters in the book of Revelations, just to be safe I check the King James Version. I would have used the Douay-Rheims but the Adventists don’t thinks it’s a real bible so I had to look at a source they accept. That’s the joke – there is no such condemnation. stick to the Bible and the Bible alone. why follow men who are also prone to sin. why not accept the truth you Catholics?? why trying to defend lies yet going against your conscience????? read Daniel 7 it will tell you about the devil leading men to trample upon the Law, why did the romans accept to fulfill prophecy??? why fulfill prophecy I may ask again??? now the church has broken and taught people to worship idols just as the commandment disapproves, you worship Mary and other so called saints whom you don’t even have their guarantee that they are in Heaven or not. work out your own salvation dear brethren. you may waste your time debating on what the SDA and the Catholics do and neither of that will get you to Heaven. don’t heretically mislead people point them to Christ. 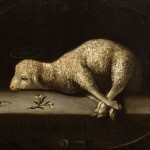 you gain nothing after all these solemn hours which could have been used for prayer and Bible study. just do as the Word says. read John 14vs15. then check yourself and the depth of your love towards Christ. honestly the pope or an adventist will never get you to Heaven but rather you will on your own. so very sorry if I have offended anyone but my main point is for us to know and love The Creator rather than wasting time defending false doctrines yet deep down we know the truths. work out your own Salvation with fear. Thanks for the rant. 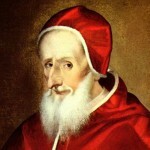 Your judgement of the Catholic Church is invalid because you clearly don’t know what we believe. We do not worship Mary, or the saints, or idols. My debating with Adventists helps many people reject or avoid false doctrine. I do help lead them to Christ.